The Upper Nile Province referred to here is not the same as the modern administrative district called 'Upper Nile'; this was a larger area that existed only until 1981, covering the districts now known as Upper Nile, Jonglei, Wahda and part of el Buheyrat [RTS -12/11/2003]. Accession Book Entry [ p. 43] - Prof. E.E. EVANS-PRITCHARD, INSTITUTE OF SOCIAL ANTHROPOLOGY, 11 KEBLE ROAD, OXFORD. 1961.8.3-6. - [1 of] Six photographs of four objects in the Sudan Museum, Khartoum (Curator: Sadik Nur). The objects are said to be unique, or nearly so. Full, typed details are on opposite page. [p. 43] 1961.8.4 (a & b) SUDAN, UPPER NILE PROVINCE, BOR GOK and BOR ATOK sections, DINKA TRIBE. 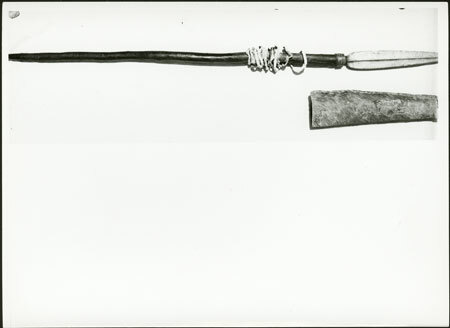 Two photographs of an iron spear with heavy wooden shaft; sheath for blade made of antelope hide; raw-hide twisted round shaft. Length of spear: 253 cms, of blade, 58 cms. (a) Shews [sic] almost the whole length of the spear, and its sheath; (b) Enlargement of blade, upper part of shaft, and sheath. (Full details on opposite page). Additional Accession Book Entry [page opposite p. 43, typed and stuck into book, with accession number added in blue ink] 1961.8.4 - Locality or tribe : Dinka, Bor Gok. No: II. 2160. Date: March, 1946. Description and Donor's Number . Iron spear with heavy wooden shaft, sheath for blade made of antelope hide - with raw hide twisted round shaft. Sacred spear known as LIR PIOU ("cold heart" i.e. "generous") believed to have come from heaven like a fallen star: and used for sacrificing cattle to LIR PIOU. It was believed to shine at night, and to twist like a snake. There were 2 priesthoods of the spear, one at the GWALLA WUT of the Bor Gok section, and one at the ANGAKWE WUT of the BOR ATOK section. Confiscated because used by the Gwalla priesthood in conspiracy to kill the chief of the Adol Wut, who was also president of Bor Gok section court. Ref: CA 18/5 - 1/5. Acquired: PRESENTED by Governor, Upper Nile Province. V. S.N. & R. XVII p.127. [added in black ink or biro] L. of spear 253 cm; L. of blade 58 cm. Notes on print reverse ms ink - "1961.8.4(a)" & ms pencil - "3"
Morton, Chris. "Dinka spear and sheath" Southern Sudan Project (in development). 03 Jan. 2006. Pitt Rivers Museum. <http://southernsudan.prm.ox.ac.uk/details/1998.203.4.3/>.